Just look at that. Do it! It's called the 7-Eleven Limited Evangelion Orochi. It's not only incredibly ugly, but incredibly rare. It's also the most expensive item 7-Eleven has ever offered for sale. That's right, 7-Eleven. Based on the Neon Genesis Evangelion anime, only one of these special cars will be offered. Sankei News reports that the pricetag is a cool 16 million yen (US$138,819). But how can you put a price on something that looks like this? Pretty easily, I guess. 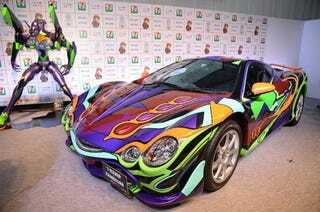 Yes, this is a custom painted Orochi from Japanese car company Mitsuoka. I like Mitsuoka! I think their cars are quite interesting and often silly in a very good way. The Orochi, which recently went out of production, is about as silly as they come and, to be honest, one fugly car. The ugliest car in the world! But hey, that's okay! It's so hideous I kinda dig it. The backside doesn't look so bad. Not sure about this Evangelion-style paint job, though. But if you have 16 million yen to spare, this 7-Eleven anime car can be yours! From November 14 to November 30, prospective buyers can enter a raffle to purchase the one-off car at 7-Elevens across Japan. This summer, 7-Eleven offered pricey Evangelion statues that sold out in minutes.